Self-service coffee shop Touch Café near Ewha Womans University. Photo by Ahn Chee-young. People pass by many stores that sell a variety of commodities. However, there is one unique café near Ewha where customers select their coffee using an automated vending machine operated by a credit and transportation card payment system. 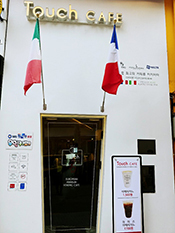 The Touch Café strives to satisfy customers by utilizing the trend of vending machine culture, which combines cost effectiveness, management efficiency and easy accessibility. Self-service shops and cafés like Touch Café reveal a trend in Korea nowadays with the advent and development of the automization. One of the representative convenience stores that have established self-service shops is emart 24, which currently runs 18 self-service facilities and plans to install more than 50 of them later on. Accompanied by the rising minimum wage due to the long-term economic recession and the 52-hour work week policy, self-service shops have become a preferred option for shop owners looking to reduce labor costs. It is also favored to alleviate the conflict regarding late-night business operation. Yeo Joon-sang, a professor in the department of Business Administration at Dongguk University, elaborated on the implementation of self-service shops in a variety of areas. However, despite the effectiveness of self-service shops, several limitations have been brought up such as the difficulty of selling alcohol and cigarettes since some machines cannot prevent sales of these items to adolescents. In other words, those items can be sold only during daytime when there is a salesperson and age verification is possible. Moreover, the process of confirmation is still complex for customers. In the case of emart 24, a person has to install a certain application and go through all the steps in the process for usage. This in turn leads to difficulties in the aspect of the payment system. Buyers have to imprint a bar code for every single product on their own and select the type of payment method, which is especially cumbersome for the elderly who are not accustomed to using digital interfaces. Regarding this issue, an anonymous person currently working at emart 24 commented on one of the conflicts about restrictions of selling alcohol and cigarettes full time. Choi Jun-jong, a senior majoring in Economics, commented on her uncomfortable experience of using self-service shops.